The regions leading group for the professional development of women and their careers. 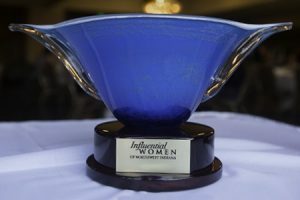 The Influential Women of Northwest Indiana recognize the region’s most successful women professionals in the areas of business, industry, and community. This exclusive event honors both established leaders and up-and-coming women in 12 industries in Northwest Indiana. Many of Northwest Indiana’s top business leaders will be in attendance for an evening of networking, gourmet hors-d’oeuvre, and prestigious award presentations. There are several ways for your business to support and participate. Sponsorships show support for these outstanding women and your organization’s commitment to recognizing women’s achievements in business. As a sponsor, you will join the ranks of companies such as the Franciscan Alliance and NIPSCO, who have proudly supported this event since it began. NWIIWA is the leading group in our region for the professional development of women and their careers. Our mission focuses on providing oportunities for professional growth through networking, leadership support, and education in a variety of industries. © Northwest Indiana Influential Women's Association. All rights reserved. Website by Diversified Marketing Strategies Inc.